The school was founded in 1933 by the decision of the Ministry of Education, in the period of the Kingdom of Yugoslavia, under the name Kralj Petar II. (The school was named after king Petar II, a very important figure in Serbian history.) The school carried the same name until the year 1937, when it was changed to Kralj Petar II Experimental Elementary School, employing the best teachers and pedagogues of the time. The name remained until the liberation in 1945. However, the documents examined show no data about the name of the school from the liberation until 1948. In 1948, the name of the school was changed to Elementary school number 4. In February 1952, the school was named “Sedma osmoletka”, meaning the seventh eight-year elementary school. There were twenty-four classes with eight hundred pupils from the first to the eighth grade. On the 21st January 1953, the Educational Council in the city changed the name of the school to Zora socijalizma Eight-year School. (The name of the school means ‘the dawn of socialism’.) From May 1957 until 1959, the name of the school was Mosa Pijade Eight-year School. From 1959 until 2002 the name of the school was Mosa Pijade Elementary School. In 2002, the name of the school was changed again, to Kralj Petar I Elementary School, which remained until the present day. On the 23rd April 1962, the School board approved of joining the school with the elementary school in Pasi Poljana. Moreover, during the existence of the school, there were integrations with Milka Protic Elementary School in Nis, the period between 1968 and 1972. In the school year 1965/1966, there were 1911 pupils in the school, divided into 24 classes and two combined classes in Pasi Poljana. The classes were held in three shifts and three school buildings – the mother school, the building in Goce Delcev Street and the one in Pasi Poljana. The school in Pasi Poljana was renovated in 1988/89, 1991/92, and 2006/07. In September 2009, the pupils in Pasi Poljana begin the school year in a new building with enough capacity for the pupils from the first to the eighth grade. In 2001, the donation given by the European Union and funds obtained by the City Council of Nis, the school building which was almost ruined was reconstructed. New equipment allowed for modern and efficient classes to be held at school. There have been plans on building a summer classroom, which should enable both the pupils and their teachers to enjoy summer days and study at the same time. In the same year, the Teacher council agreed on returning the school its former name of King Peter. Today, Kralj Petar I Elementary school is trying to find its way towards regaining or even exceeding its former reputation, by its activities, successes but also its pleasant appearance. The school was verified by the Ministry of Education in 2009. Today, in Kralj Petar I Elementary School there are forty classes with 1044 pupils from the first to the eighth grade. The mother school in Nis counts thirty-one classes with 831 pupils from the first to the eight grade, whereas the school in Pasi Poljana counts nine classes with 213 pupils from the first to the eighth grade. The school employs seventy teachers, one teacher assistant, the principal, the deputy, professional co-workers (the pedagogue, the psychologist, librarians,) administration and finances co-workers (the school secretary, the accountant, the paymaster,) and fourteen members of staff incharged of hygiene. By the rescript number 610-00-25472012-7 from the 17th July 2012, the school was granted the permission to introduce pre-school education. Only eight out of the total number of seventy teachers at Kralj Petar I Elementary School work exclusively at the school in Pasi Poljana, whereas seven teachers work at both schools, meaning that there are fifteen teachers in total in charge of teaching at the school in Pasi Poljana. During the last school year, the school had great results. The pupils of Kralj Petar I Elementary School were successfully engaged in all elementary school competitions on different levels – city, region and republic competitions. Based on this, the Annual plan represents a synthesis of achieved results and future tasks. The curriculum is, at the same time, a framework of the curriculum tasks within a school year and the basis for a regular and equal distribution of tasks throughout the entire school year. The curriculum emphasizes the developmental principle of the functioning of the school, i.e. an extension of the already achieved level of knowledge and development. This school represents a safe and encouraging environment for all pupils. The Programme of pupil protection against violence, abuse and neglect is actively realized at school. This programme clearly defines measures and activities the realization of which should ensure the prevention and protection of the pupils. The safety precautions include well-organised monitoring, adequate lighting both, in the building as well as in the schoolyard. The schoolyard is proprely enclosed. In addition to all that, the school police officer visits the school regularly. Some of the students are subject to special disciplinary activities. Numerous activities aimed at preventing violence, abuse and neglect are realized. The pupils were introduced their rights, obligations and responsibilities. A lecture about SAFETY CULTURE OF THE YOUNG was held among the fifth-grade pupils. Kralj Petar I Elementary School has been engaged in the project My school- a school without violence since 2007. The School team, formed for the purpose of the realization of this project, with the assistance of a mentor, conducted all the steps planned in the project. The project was supported by the Parent-teacher association, Teacher council and School board. At the beginning of every school year, an electoral and constitutive meeting of the Student council is held. New members are elected democratically. Each class in the seventh and eight grade should elect two members of the Council. The meeting is the occasion where the president, deputy and clerk are elected. In addition to that, the annual plan of activities for the following school year is decided upon at the meeting. One of the activities conducted by the Student council is the action Collect the cans, save the environment. This action was proposed by the Recan Fund, with the aim of collecting and recycling cans. 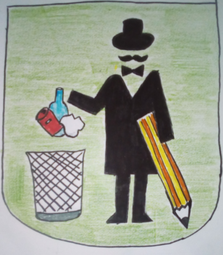 By joining the actions, the school was obtained all the necessary educational material: brochures, leaflets, posters and films, as well as boxes and bags to dispose of the collected cans. In order to engage younger pupils, we used the leaflets given by the fund, and created a multimedia presentation. It was showed to the pupils in the form of a game, in order for them to grasp the initial idea of the action, which is to raise awareness of how important it is to protect the environment and recycle cans. Our school is a member of the organization Young Ambassadors.This organization was founded with the aim to reinforce the potential of the young in Nis, through different actions of promoting cultural and other events, that improve the image of the city on one hand, and encourage the personal development of an individual. On 25th May 2009 Kralj Petar I Elementary School in Nis by the consent of the Ministry of Education number 610-00-00124/2009-06 was granted the permission to introduce experimental bilingual classes (in which the classes would be conducted in both, Serbian and English language) in the seventh and eighth grade, in the school year 2009/2010. The consent was personally signed by the Minister of Education. Our school is, besides one school in Belgrade, the only elementary school in Serbia to organize this type of classes. The teachers at this school believe that educated in this manner, future young experts will contribute to the development of our city and entire region. We are aware of the fact that foreign investors expect the experts to be acquainted with a foreign language, not only on the level of mere communication, but also in highly professional fields. The pupils are given classes in physics, science, PE, DT, art, music, ICT and civil education in both, English and Serbian. This school started planning this type of classes three years before in order to prepare the teachers and pupils, and obtain all the material and technical conditions for the classes to be as qualitative as possible. If the pupils are interested in reciving the high school education in the same manner, it is possible in Svetozar Markovic Grammar School which introduced bilingual classes in the school year 2011/2012. Among former pupils of the school, there are many who grew out to be prominent members of the society. Our former pupils are successful in various fileds, such as science, sport, art, etc. Branimir Djordjevic was born on 22nd October 1942 in Nis. He acquired his PhD at the Faculty of Electronics in Nis. Today a very respectable professor and scientist, was once equally respected by his teachers and peers while in the elementary school. Nenad Cvetkovic, born in 1948 later became a famous athlete. Having finished school, he became dedicated to achieving a successful career of a football player. He had a long and fruitful career in Serbian football clubs, but, what is more important, as a respectable football coach worldwide. Vladan Dinic Dinja, born in Zadar, in 1949, received his elementary education in Kralj Petar I Elementary School in Nis. His professional life of a journalist was marked by a successful magazine he founded, among many other achievements. Slobodan Gejo, once an alpinist, today is a free-climbing coach and a professor at the Faculty of Occupational Safety. Dragan Gajic became a professor at the Faculty of Sciences and Mathematics. He teaches mechanics and astrophysics. Slobodan Antic, born in 1950, also became a famous athlete. His football career includes playing in various Serbian and foreign clubs. In addition to that, he was a football coach in different clubs worldwide. Predrag Miletic, born in 1952, grew up to be a respectable actor in the theatres of Nis and Belgrade. Vukman Krivokuca, born in 1955, is an economist who works in the Serbian Government. Bojana Sumonja, born in 1953, a journalist and athlete. Oliver Njego, born in 1959, achieved world fame as an opera singer. Miroslav Stojanovic, born in 1965, today is a surgeon and a professor at the Faculty od Medicine in Nis. Dragan Stojkovic Piksi, born in 1965, is one of the most famous Serbian football players and coaches. Tamara Pejic, born in 1970, once a successfull shooter, today is a doctor of doping control and a coach. Bojana Popovic, born in 1979, is another athlete that was a pupil of Kralj Petar I Elementary School in Nis. She is believed to be one of the best handball players of the world. Kralj Petar I Elementary School cooperates with several foreign schools and colleges. Cooperation with schools from Bulgaria, Macedonia and Greece were unforgettable experiences both for the teachers and pupils. In addition to that, the school cooperates with a school from Begles, France. The cooperation resulted into mutual visits. In addition to that, the pupils of the French school made a donation in the form of nearly two hundred books for the library of our school. This cooperation is coordinated by Aleksandra Arsic, a French teacher from our school, but supported by the principal, as well as the French consul in Nis, Sasa Miljkovic. The long-term aim of this cooperation is not only an exchange of expirience, but also finding a mutual way towards European funds.